Pierre Francois Jumeau and Louis Desire Belton went into partnership on Jan 15, 1842. Although it was a partnership Louis Desire Belton was the captain of the ship. They paid particular attention to the dressing and assembly of dolls. Thus all the creative genius of Pierre Francois would be deployed. With an extensive experience with cloth and assemblage, having spent his entire youth in the fabric trade, Pierre Francois possessed a refinement that contrasted with his friend Louis Desire, whose professional abilities were directed more towards sales. The Belton and Jumeau Company dissolved on Feb. 14, 1845. From 1842 to 1855 Jumeau produced poupees (fashion dolls) with heads of paper mache. 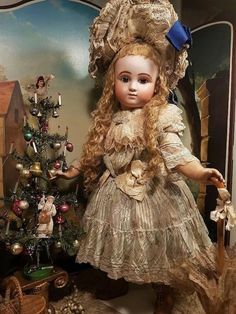 In 1855 Jumeau exhibited fashions dolls with porcelain heads. These heads were not produced by Jumeau, he did not start producing his own heads until 1872. Poupees were discontinued in 1882. The Jumeau Co. started producing Bébé’s in the 1870’s. I have divided them into groups by age and markings. Production of one style or another always overlapped. One model did not immediately end when another began. There was always old stock still remaining to be sold and new models might be gradually and cautiously introduced while public acceptance was being tested. 1876/1877 – Bebe Incassble with standard face (so-called “Premiere Jumeau Bebe”) is slowly introduced. The face of this Bebe is clearly evolved from the standard poupee model. The Bebe was probably offered until about 1883 in smaller sizes 0 and 1, but emerged into the E.J. Bebe prior to that time in larger sizes. 1877/1878 – Bebe Incassable with deluxe face (so-called “Portrait Bebe”) appears. The face of this bebe is clearly evolved from the deluxe or Portrait Poupee. 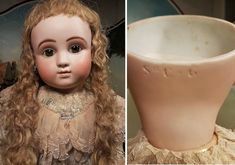 The model was probably offered until 1883/1884 although it was gradually supplanted with the very similar bebe marked E.J. (without Depose) mark. 1878/1880 – Bebe Jumeau (Carrier-Belleuse model, so-called “Triste”) appears. It’s appearance coincides closely with the so-called Portrait Bebe, but was clearly distinct. The model was offered until 1886/1887 when pressed bisque was discontinued. 1879 – Bebe marked “E.J.A.” The model appear to be offered for only one or two years. 1881 – Bebe with first “E.J.” markings(without Depose) is introduced. This is an evolution of Bebe Incassable. It also passed through several evolutionary stages with two distinct styles of marking. It was replaced with the Depose mark in 1885. 1885 – Bebe marked “E.J. Depose” appears. This is produced for only one or two years un the discontinuance of pressed bisque in 1886/1887. Bebe incised “Depose Jumeau” also appeared. This is only produced for two or three years. 1886-1887 – Bebe with red decal stamp “Depose Tete Jumeau” appears. With various technical modifications and various markings, this is the standard line model which appeared until 1899. 1892 – Bebe marked “Paris Bebe” is introduced. Bebes marked E.D. and B.F. are introduced. Bebes marked with 200 series of numbers appear. Although a luxury, commissioned line, they remained “available” until 1899. Department store Bebe’s marked R.R. Bi, P. et. Al. introduced. The “Bebe Jumeau”, “Long Face Cody Jumeau”, or “Jumeau Triste” is beautiful by any name. 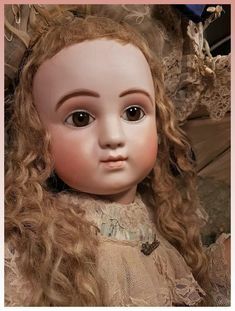 The sculpting is exquisite and the doll has universal appeal. She was first introduced in December 1879 by Emile Louis Jumeau. This Bebe Jumeau had several firsts. It was the first Bebe to be especially modeled by a noted sculptor. The “Triste” was sculpted by Albert Ernest Carrier Belleuse who used King Henry of Navarra at the age of four as his model. It was also the first bebe that the “new” human glass eyes had been especially developed. The ears were also applied separately to the head. This was a first for the Jumeau company. 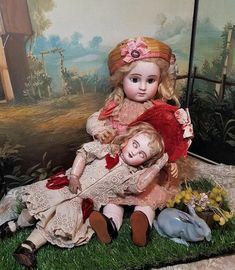 Legend has it that “Buffalo Bill” Cody from the American West was presented one of these dolls for his young niece when he visited Paris with his Wild West Show in 1889. This story is quite interesting although unverified. Illustration 17: Fashion Doll made in the 1860’s. Illustration 18: Premiere Bebe Incassable. Illustration 19: Left- 20” Deluxe Bebe Incassable Marked 9 Right – 22” Deluxe Bebe Incassable Marked 10. Illustration 20: Carrier-Belluse Model known as “Triste” or “Long Face Jumeau”. Illustration 25: “Paris Bebe” – The doll with a court battle. After his departure from the Jumeau Company, Anatole Danel partnered with three other men and formed Danel et Cie. On October 21, 1889, they registered the trade name “Paris Bebe”. Jumeau had been quiet about his competitor, until now. The obvious similarities between the bebes of the two companies irritated the partners at Jumeau, who spotted a French copy of Bebe Jumeau immediately. At first they filed a complaint that Danel had stolen molds from his factory, but his case was thrown out due to lack of evidence. Then Jumeau decided to bring suit for unfair competition before the Commerce Tribunal. At the end of the trial, justice was served. The courts ordered the destruction of molds, models, and tools involved in the production of “Paris Bebe”. This decision led to the termination of Danel et Cie on March 29, 1892, and the disappearance of Anatole Danel from the Paris scene. After winning the trial, Jumeau capitalized on the “Paris Bebe” advertising of Danel et Cie by presenting his own “Paris Bebe”. But he took great pains to create a distinctive new character head. His new sculpture was a model of the Duke of Bordeaux. The face had distinct character-like features with sharply defined features, glass eyes, and closed mouth. The features are nearly identical to the 223 character model of Jumeau. It was likely that the sculpture was marketed both as Paris Bebe and then as the 223 character. It was signed with a red decal stamp “Paris Bebe Tete Depose” and size number. Illustration 26: The Bebe Francais trademark had been registered by Danel et Cie on Sept. 11, 1891 and was taken over by Jumeau after he won his infringement lawsuit. On Oct. 17, 1896, Jumeau renewed the trademark as it was about to be returned to public domain. Ironically, a model named Bebe Francias ws never produced by Danel et Cie. Yet Jumeau used the trademark to introduce his second unique bebe model of the 1890 era. 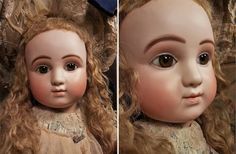 While the Bebe Francias bears a resemblance to the Bebe Jumeau, the resemblance is mainly in the style of eyebrow painting. The model was new and had elongated, yet full, face with well defined pointy chin and very small closed with a prim expression to the lips. The model is signed with the incised letters B.F. enclosing the size number. Illustration 27: Jumeau 203 – Smiling child. The mouth has a realistic smile with a row of sculpted teeth between the lips. Wide dimples form the corners of the mouth and shape the rounded cheeks. The eyes are rounded and realistically shaped. The model differs from the other smiling character, 208, in both the shape of the mouth and the eyes. Illustration 28: Wildly-laughing child. The eyes are very small and narrowed with modeled lower eyelids twice the size of the actual eye. The mouth is made to appear open with very wide smile creasing the cheeks and creating deeply impressed dimples. The inside of the mouth is sculpted with two rows of teeth and the impression of a shaped tongue. The chin is tiny and pointed, the nose upturned at the point. The lips are shaded with accent lines at the outer edge. The brows are arched and multi-feathered, the lashes are brown, straight stroked angled sideways.